Everyone has the right to seek asylum under international law, but public discourse in Australia about refugees is dominated by scare-mongering and political point-scoring. The government seeks to ‘stop the boats’ whatever the cost, be it human, economic, moral or legal. In this new book, Jane McAdam and Fiona Chong find that Australia’s policies towards refugees have hardened since their previous bestselling book was published five years ago. 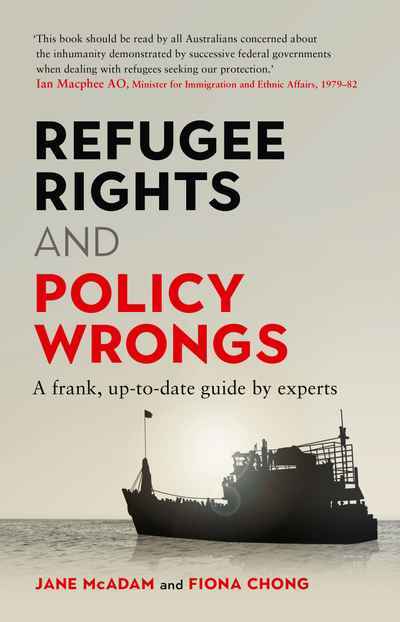 Now, Refugee Rights and Policy Wrongs provides a wholly updated account of Australian refugee law and policy. Clearly and carefully, they explain who a refugee is, what rights refugees have under international law, and whether Australia’s policies on offshore processing, detention, boat turnbacks and so on violate Australia’s obligations under international law. The book also outlines what a human rights-based protection framework might look like and how Australia could show greater global leadership on refugee issues, so as to expand the protection space available to refugees in the Asia-Pacific region. McAdam and Chong trace the ways in which draconian domestic laws enacted over recent years blatantly contravene international law –obligations that Australia has voluntarily signed up to. People seeking asylum, especially those held indefinitely on Manus Island and Nauru, have been broken as a result. The crucial information and depth of understanding this book offers has never been more urgent.